» Obituary: GENEVIEVE HOLDEN (1919-2007). Genevieve Holden, the author of seven mystery novels between 1953 and 1976, died Sunday, April 22nd, in Atlanta GA at the age of 87. As a mystery writer born and raised in Mississippi, she is one of the many authors honored by being included in the University of Mississippi�s online archive exhibit entitled Murder With Southern Hospitality: An Exhibition of Mississippi Mysteries. �Genevieve Holden is the penname of Genevieve Long Pou, who was born in Tupelo, Mississippi in 1919. She attended the University of Mississippi for two years before transferring to the University of Georgia. After college, Pou worked on the Birmingham Post and the Idaho Statesman before writing her first mystery in 1953. 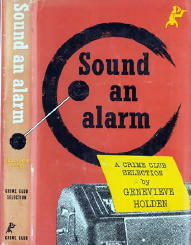 Expanded from her entry in Crime Fiction IV, by Allen J. Hubin, here is her complete bibliography. Each of her books was published first in hardcover by Doubleday, all of them under their famed �Crime Club� imprint. 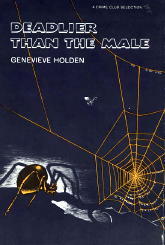 Reiterating what was said by the librarians at U-Miss about the nature of her books, the two reprinted by Ace were published as part of their �gothics� line of paperbacks. The cover shown is quite typical; no would-be reader, almost invariably female, would look at the cover and not know what to expect if it were to be picked up and read. 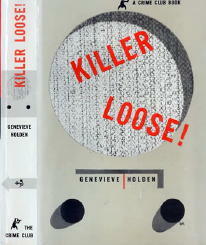 Killer Loose! The leading character is Janet Milton, who with her young nephew Tolly, goes on the run from a psychopathic killer, apparently dressed in the uniform of a sheriff�s deputy. Lt. Al White is not mentioned. Sound an Alarm. In true �gothic� fashion, Linda Stanley is hired as a governess for a grandchild and young heir. 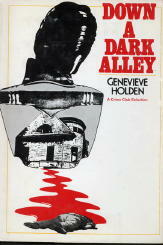 The house is a mansion with �cavernous halls with a sense of portending evil.� Lt. Al White again is not mentioned in the blurb. The Velvet Target. Eve Halsey is suspicious of her new uncle, believing that her wealthy aunt had made a bad choice in marrying him. Lt. White agrees, and he begins a race against time to rescue Eve when the honeymooners take her along. Something�s Happened to Kate. Menacing danger is in store for Kate Woodley after she meets handsome Jim Garrett � and disappears. Lt. Al White not mentioned in the blurb. Deadlier Than the Male. It is difficult to say for sure, but contrary to Barzun & Taylor, this seems to be the first book in which a PI is involved, Hank Farrell in this case. Don�t Go In Alone. Police detective Captain Mark Latham has a case of three missing Atlanta women on his hands, all of whom went into vacant homes on the real estate market and disappeared. Down a Dark Alley. Captain Mark Lathan (sic) returns [a series character previously unknown to Al Hubin] to solve the shocking murder of member of a motorcycle gang. Dinah Prentiss�s Victorian aunt is the primary suspect. Without knowing more about her books than this, do you also get the impression that there was a lot more toughness to Ms. Holden’s mysteries than you might have assumed at first? Would love to hear more, but sounds to me like there were a lot more of these female noir writers than first meets the eye. Juri, While I certainly agree that reading some of Genevieve Holden’s books could easily prove worthwhile, I’m hesitant about calling her a “noir” writer. I used the word “toughness” to describe her work, and deliberately so. There’s no way I can imagine that the term “hard boiled” as applying. I have to admit, though, that until you suggested it, the “noir” category never even occurred to me.